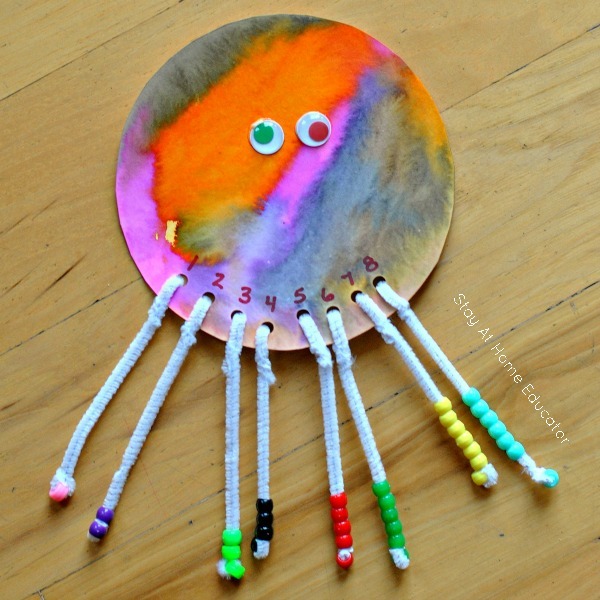 Summer is here, which means it’s time to study an ocean theme in preschool. From ocean sensory bins to creative sea-life crafts, these ocean activities are the next best thing to having preschool classes on the beach. 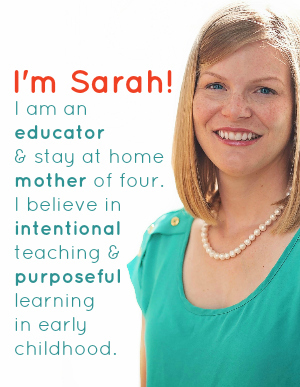 Ocean theme is one of the most popular preschool themes, and for good reason. Aside from it being to stinkin’ fun, it’s easy to load it up with all sorts of developmental skills. 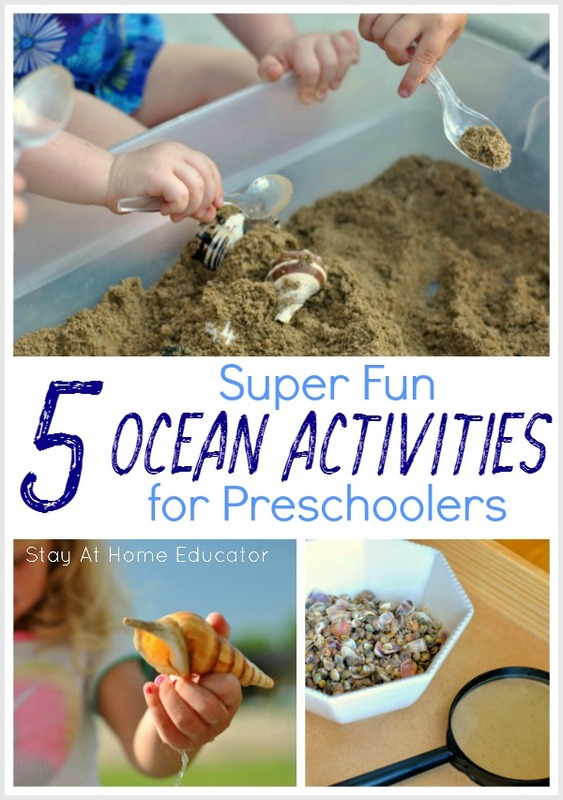 Here are five super fun ocean activities your preschoolers will love this summer! Pour a few inches of sand into a sensory bin. (I still just use an under-the-bed storage tote for our bin). 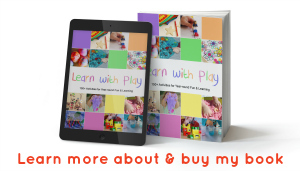 You can use kinetic sand for some additional fun, or just regular play sand. Add some seashells on top with a few plastic spoons and invite the kiddies to come and play. 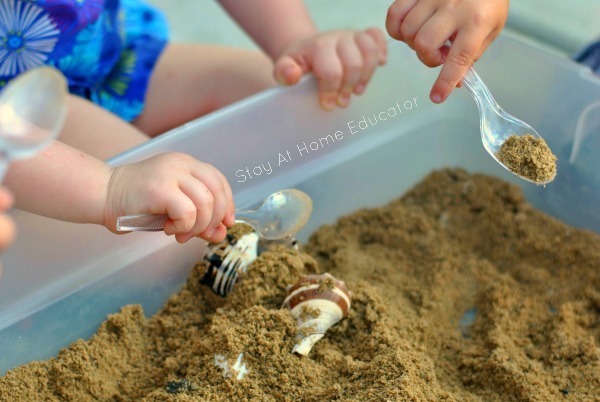 My preschoolers loved using the spoons to hide the seashells, and of course, I loved it because scooping and pouring is such valuable fine motor work. 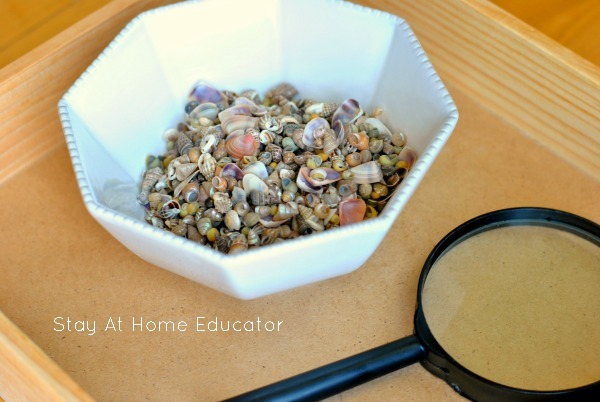 Place a small bowl of seashells on a wooden tray with a few magnifying glasses. Display several books about seashells and the ocean around the tray. Invite your preschooler to come to the ocean science center to look at the seashells and find them in the books. Flatten coffee filter and place on a tray. Use liquid watercolor to drop paint onto the coffee filter. 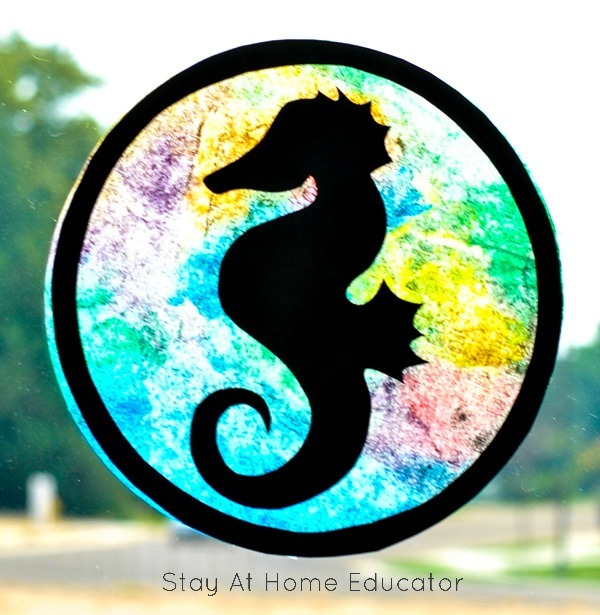 Allow to dry, then add a seahorse cut-out, glue down, then hang in a window. I just hand drew out seahorse silhouette, then photocopied it onto black construction paper and cut them all out by hand. 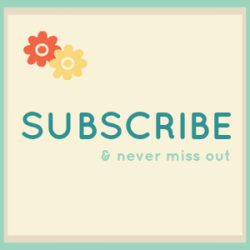 You can skip cutting them out by hand by using a Cricut cutting machine. Fill the water bin with a few inches of water. 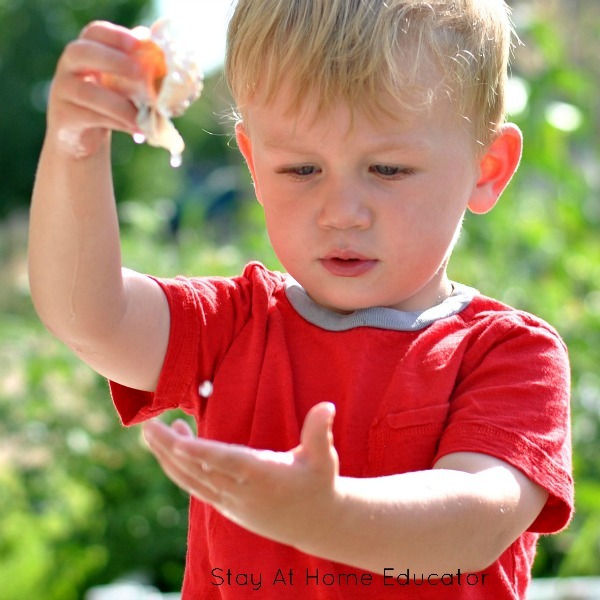 Add seashells and invite your preschoolers to explore the them. They will fill them with water and watch the water drip out. They will water them bubble as they fill with water. So simple, yet always a huge hit! Just look at the concentration of the little guy below! Invite the preschoolers to use the small Kwik Stix to color the plate. Allow to set. Add googly eyes. Punch eight holes around the edges for the tentacles. Twist one pipe cleaner through each hole punch. Add pony beads. I numbered the holes so the children could have some extra counting practice, but that step is optional.